Are Full-Body Scans A Scam? Full-body CT scans -- widely promoted in advertisements as a way to give yourself peace of mind -- frequently find harmless abnormalities that lead to invasive, anxiety-producing follow-up tests, researchers say. And they may be a waste of money for patients under 40, who run a low risk of serious disease, the study suggests. "This got pushed to the public before any of the research was done," said Dr. Giovanna Casola of the University of California at San Diego. "They're saying do it for your peace of mind, do it for your wellness, for your family. Nobody's saying, `Half the time we're going to find things that you're going to worry about,"' sometimes needlessly. The increasingly popular scans - widely promoted in radio and TV ads and on billboards - give doctors a view into the body from the neck to pelvis with CT scan machines. The scans typically are offered at private, for-profit centers, cost several hundred dollars or more and usually are not covered by insurance. "It's really fun to be able to sit with people and give them a tour of their insides," said Dr. Max Rosen, medical director of a scanning center in Boston. "They're riveted by it." Casola and colleagues studied 1,192 patients ages 22 to 85 who had full-body scans at private, for-profit imaging centers. They presented their findings Tuesday in Chicago at the Radiological Society of North America's annual meeting. Forty-six percent of the scans showed abnormalities, most in the lungs, kidneys or liver. About 25 percent were suspected cancer; 15 percent were other significant ailments such as emphysema; and just 1 percent were strongly believed to be cancer or some other life-threatening disease. Thirty-seven percent of the participants were advised to have follow-up tests. No one under 45 had scan results that strongly suggested cancer, and patients younger than 40 had very few findings requiring further tests, Casola said. Other research has shown that follow-up tests usually determine that scan-detected abnormalities are insignificant. Casola said that is probably the case with many of the study participants, though data on subsequent testing generally was unavailable. "Many of these for-profit centers don't follow up on their patients to see what happens to them," she said. Most people in Casola's study got the scans on their own and were not referred by their doctors. 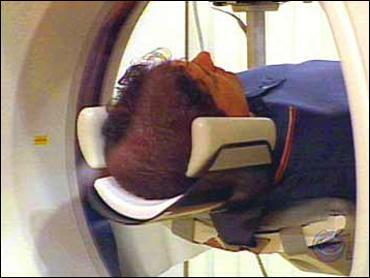 Many physicians are skeptical of the scans because they have not been well-studied, said Dr. Stephen Swensen, the Mayo Clinic's chief of radiology. And the scans are not foolproof. Judie and John Roth of Morris, Ill., discovered that about a year ago when they gave each other full-body scans as anniversary presents. Results for both turned up nothing suspicious, but a month later John Roth, an obstetrician-gynecologist, was diagnosed with bladder cancer. "It was just kind of a shock," said Judie Roth, 60. "I didn't get any really good answers when I called the scan people back," she said. "What they pretty much said was, maybe because of the size of the tumor" it was missed. Swensen said people should not have the scans unless they have consulted their own doctors and are referred by someone who doesn't have a financial interest in the tests. "There's no medical society in the world that recommends this," Swensen said. But Rosen said discouraging patients from getting the scans is "really doing them a disservice." "A lot of people say I'm hoping seeing the images of my lungs will help me stop smoking," said Rosen, a Harvard Medical School radiologist. "A lot of people want this and are using it to make lifestyle changes." Dr. Edward Bluth, chairman of radiology at the Ochsner Clinic in New Orleans, said that more research is needed but that it will probably show the scans are useful. In the meantime, he said, people who want them and can afford them should be able to get them. "I really do think this is the future," Bluth said.